Genuine OEM Xerox Solid Ink Sticks, Black, 18,000 page yield. Xerox part number: 108R01017. Solid Ink Sticks compatible with Xerox ColorQube 8900. Genuine OEM Xerox Solid Ink Sticks, Cyan, 16,900 page yield. Xerox part number: 108R01014. Solid Ink Sticks compatible with Xerox ColorQube 8900. Genuine OEM Xerox Solid Ink Sticks, Magenta, 16,900 page yield. Xerox part number: 108R01015. Solid Ink Sticks compatible with Xerox ColorQube 8900. Genuine OEM Xerox Solid Ink Sticks, Yellow, 16,900 page yield. 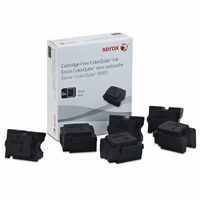 Xerox part number: 108R01016. Solid Ink Sticks compatible with Xerox ColorQube 8900.